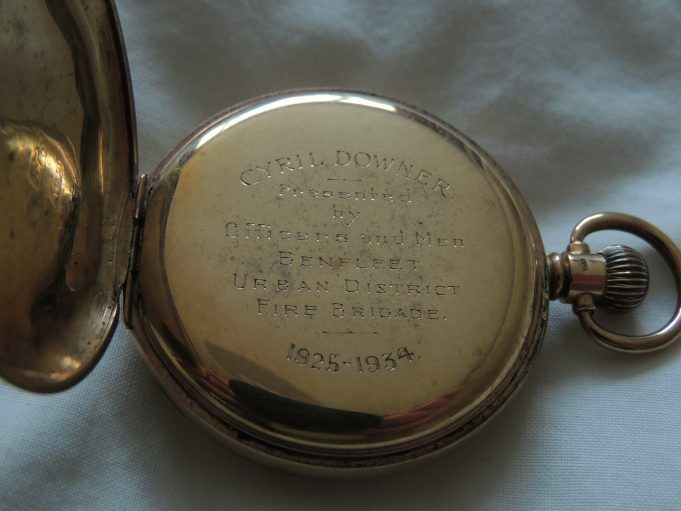 My father, Cyril Downer, served as a member of Benfleet Urban District Fire Brigade from 1925 to 1934 and on the 17th October, 1934 he was presented with a gold watch from the Officers and Men of the Brigade. 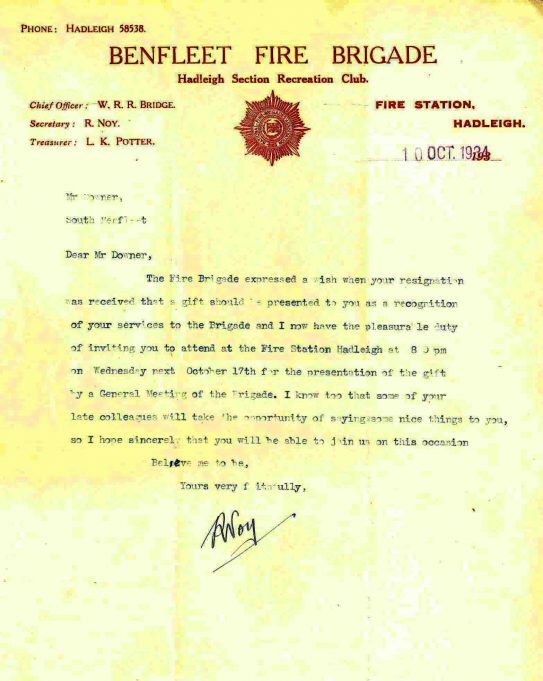 This invitation, dated 10th October 1934 was sent to my father for the presentation of a gift upon his resignation from the Brigade. 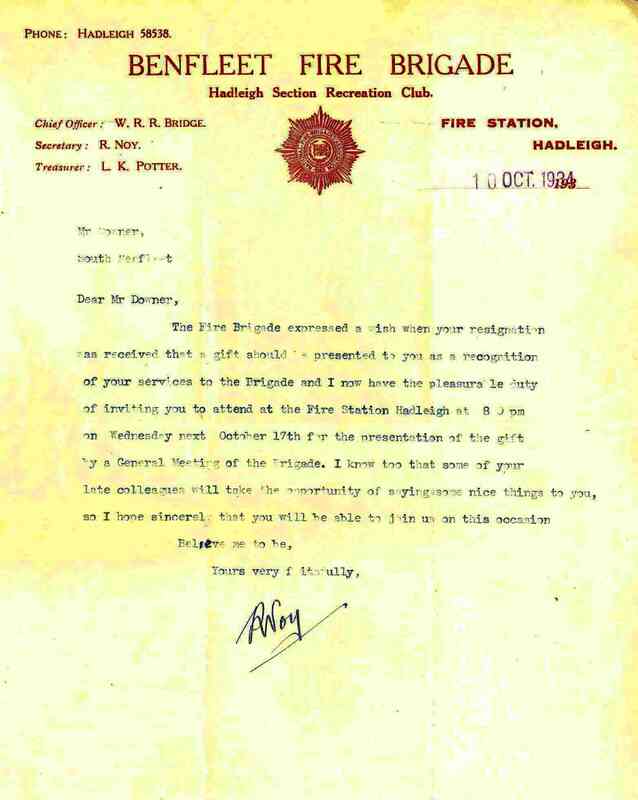 The Fire Brigade expressed a wish when your resignation was received that a gift should be presented to you as a recognition of your services to the Brigade and I now have the pleasurable duty of inviting you to attend at the Fire Station Hadleigh at 8 pm on Wednesday next, October 17th for the presentation of the gift by a General Meeting of the Brigade. I know too that some of your late colleagues will take the opportunity of saying some nice things to you, so I hope sincerely that you will be able to join us on this occasion. 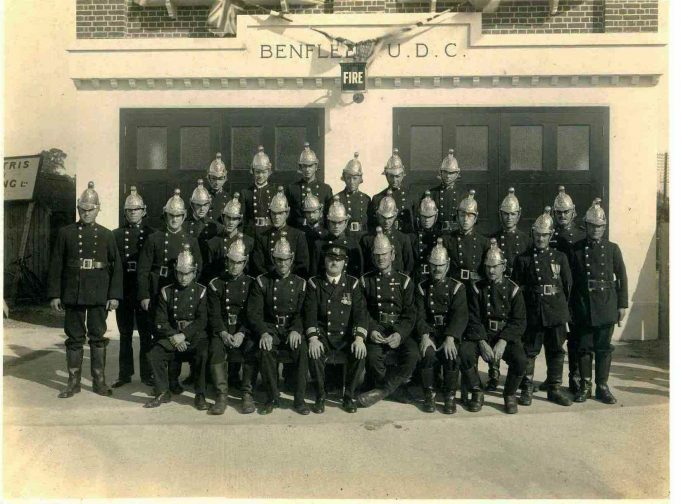 The exact year this photo was taken is not known but presumably it was just after the Hadleigh Fire Station opened. My father is seated on the left of the picture. A gentleman, O I C Powell who ran the cafe in the High Street by the station, is sitting in the front row, third from left. 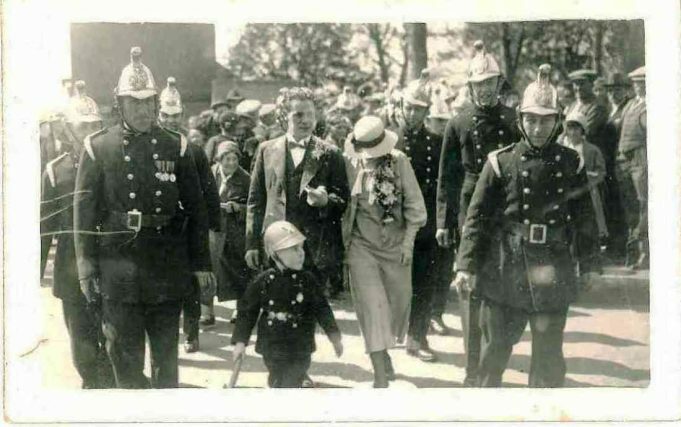 This photo was taken at Ted Land's wedding, date unknown. 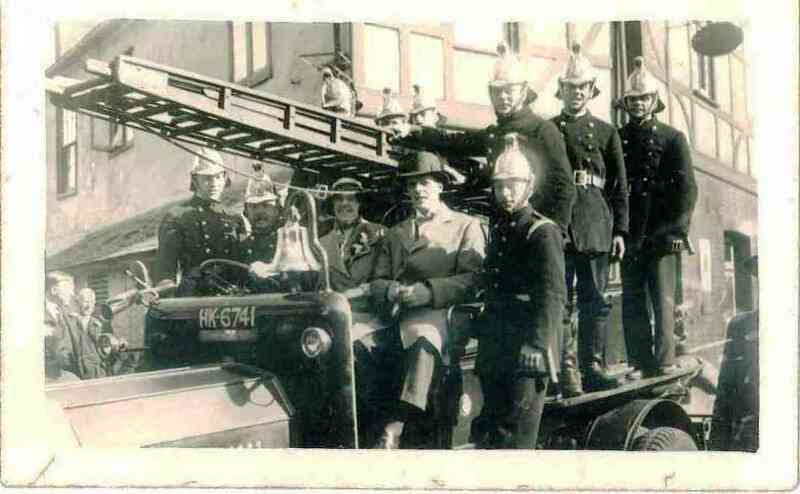 Ted was the landlord of The Anchor Public House and also an auxiliary fireman. 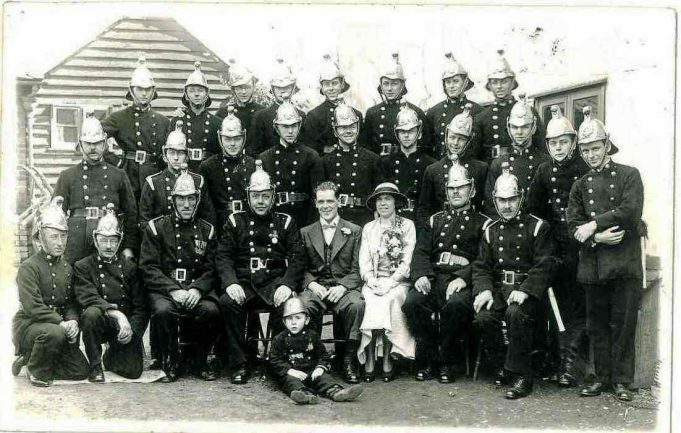 My father is second from the left in the second row. Ted Land's wedding. My father is standing on Mr Land's left on the engine. Ted Land's wedding. My father is front right of the picture next to the bride. Probably practice sessions in the farm next to the Methodist Church, my father is third from left. This was probably practice session in the farm next to the Methodist Church in the High Road, now occupied by Cribb's the Undertakers. The date would have been after 1931, as the Methodist Church is visible, and not later than 1934. 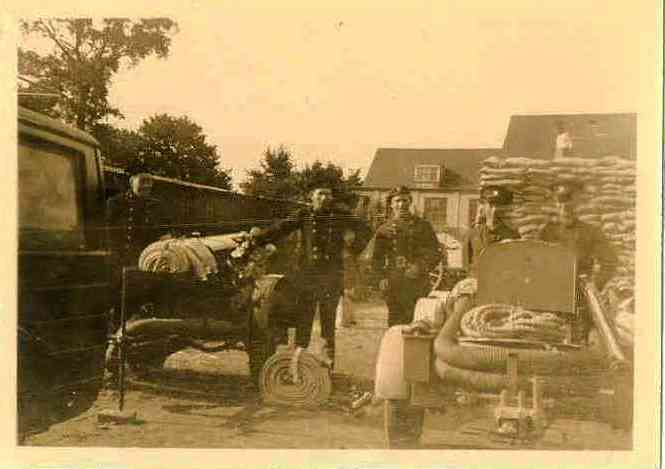 Probably practice sessions in the farm next to the Methodist Church, my father is far right of the photo. This was probably practice session in the farm next to the Methodist Church in the High Road, now occupied by Cribb's the Undertakers. The date would have been after 1931, as the Methodist Church is visible, and not later than 1934. 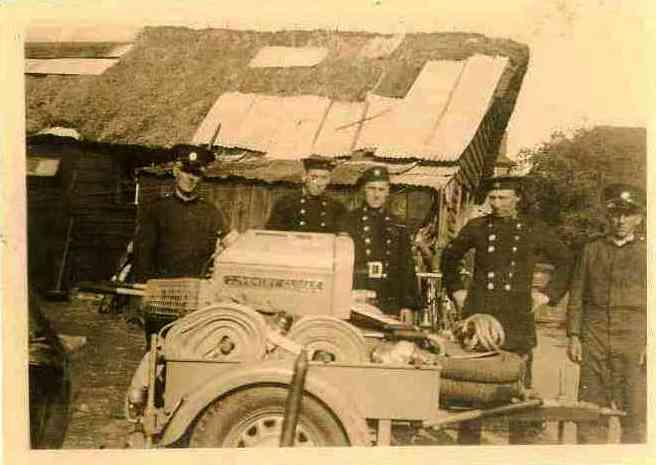 The Shepherd engine sits outside the Fire Station in Essex Way, formerly Endway. 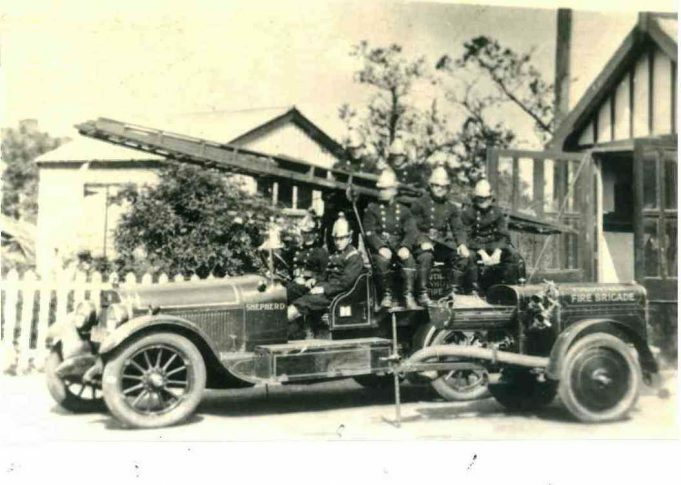 My father Cyril Downer is seated in the passenger seat of the engine. I have seen the pictures of Ted Land, I am related to him he was my uncle with my uncle George and his sister Amabel who was my Nan. I have spent a lot of time at the Anchor pub as a little boy. I have pictures of my Mums Wedding when she got married from the Anchor. Hi, great article. 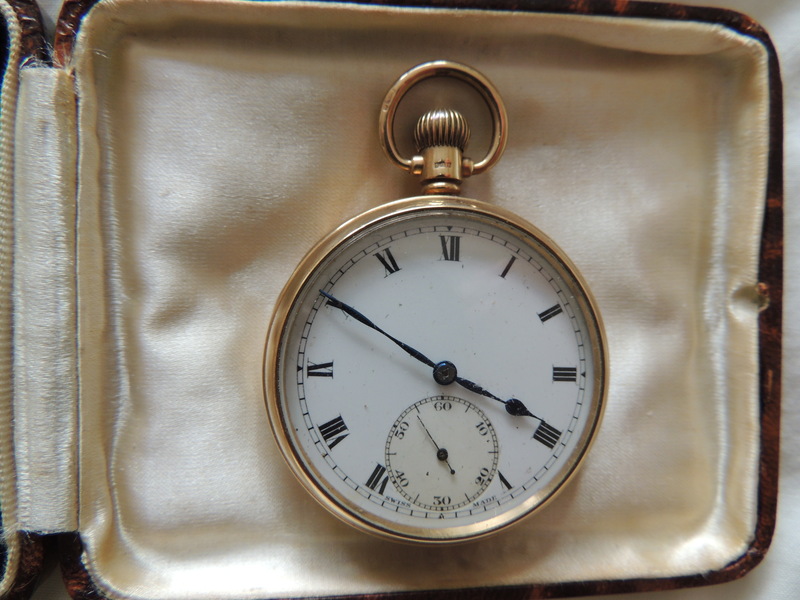 I think that Ted Land was born Wiliam Edward Land on 2 March 1907, and married Miss White in the quarter April to June 1934. He received the 1953 Coronation Medal, & Fire Brigade LS medal.